When I moved to D.C., my seasonal allergies, which had always been occasional and mild, suddenly became frequent and aggressive. In addition to the usual runny nose and puffy eyes, I would get crushing sinus headaches, fatigue, and an odd kind of lightheadedness. No fun at all, especially not during long organic chemistry study sessions. I admit, I’ve tried many of these, and while nettles seem to show promise so far, a lot of them (including, I’m afraid), the neti pot, don’t seem to be helping. Still, I’ll keep trying, and in the meantime I’m also trying to emphasize foods that are rich in Vitamin C and quercetin. Quercetin is a compound found in red onions, in berries, and in tea (among other sources) which may reduce allergic inflammation and symptoms. 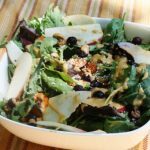 Quercetin supplements exist, but since onions, berries, and tea are quite commonplace within a plant-based diet, it’s easy to combine them in recipes–and this sweet salad is a great example. 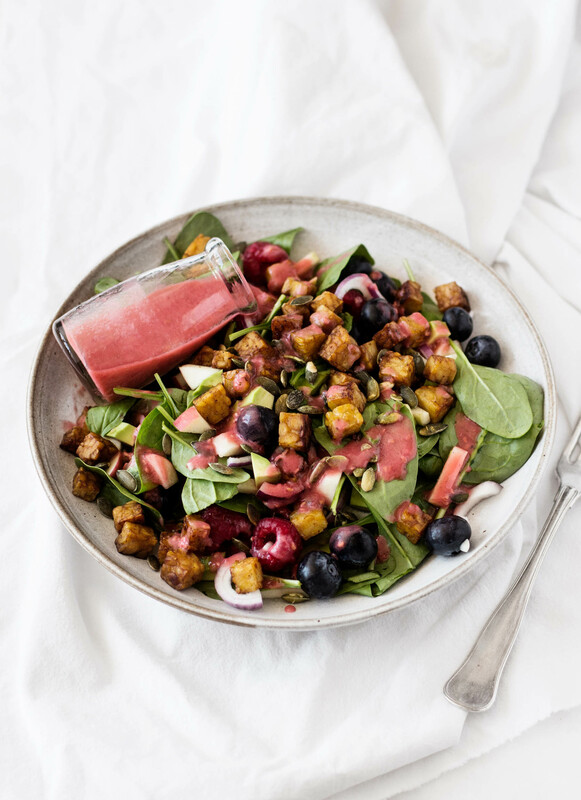 The salad combines a lot of ingredients that I wouldn’t normally think to pair, including fresh berries and tempeh. But I loved the results. 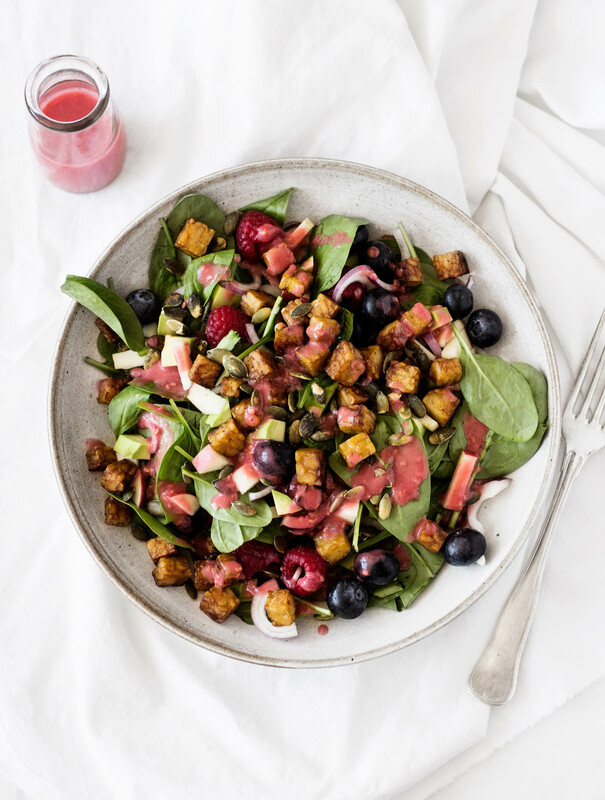 The berries and vinaigrette add lightness and summery flavor to the salad, while the tempeh adds earthiness, umami, and tons of plant based protein. It’s a really interesting mix of flavors, if you can forgive the oddness, and I hope you’ll like it as much as I did. I love how this salad pulses with color! And it’s full of texture, too. Blend all dressing ingredients in a blender till smooth. Set aside. Heat the olive oil in a small saucepan over medium heat. Once it's shimmering, add the tempeh cubes. Cook for 2 minutes on each side, or until the cubes are evenly browned, adding a few splashes or sprays of tamari or Bragg's as you go. The tempeh will take about 7-8 minutes in total. 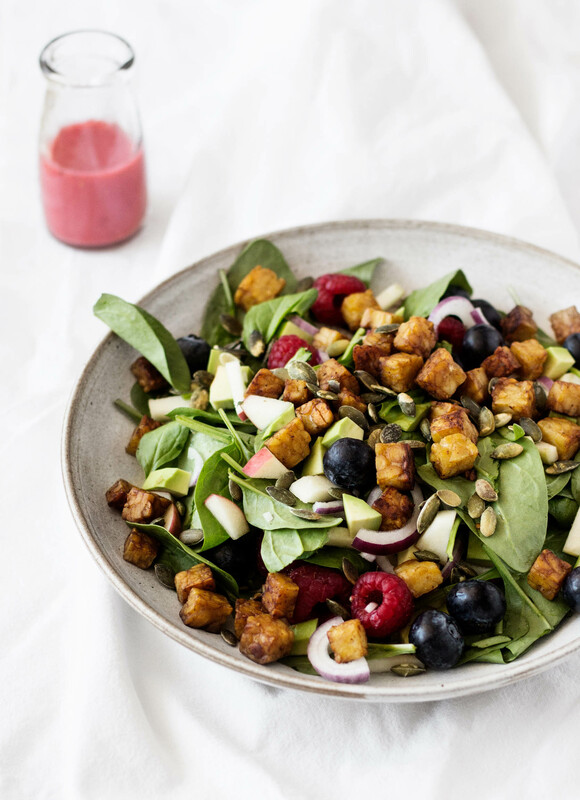 Mix the berries, spinach, onion, apple, and avocado together in a large mixing bowl. Add the cooked tempeh cubes and toasted seeds. Dress with as much vinaigrette as you like, and enjoy! Serve the salad with a couple slices toast, a grain pilaf, or a hearty legume soup to make it a complete meal. Hope this post is helpful to all of my readers who are sniffly, sneezy, or sinusy right now! Sorry you have bad allergies! I woke up with some bad ones, even though I do take Zyrtex too. I suffered for years trying to find natural things to help me and nothing was as powerful. I am not really into suffering for the sake of suffering, so I take the med. Nettles are good for you for other reasons, like they have lots of iron and vitamin C together so it absorbs well. My personal favorite nettles are ones I dehydrated myself from the farmer’s market and make into tea. You’re reminding me a cup wouldn’t hurt tonight before bed. I take Quercetin with Bromelain and I swear I am almost entirely symptom free, while my husband who takes Zyrtec AND a prescription nose spray still suffers. I swear by the Quercetin! (I took Dhist for years and it worked, but cost A LOT.) Just remember all of these take quite a bit of time to build up in your system and become effective. So they’re not so helpful for quick relief. However, Quercetin can be taken in conjunction with Zyrtec while your body adapts to the supplement. Celebration Herbals Nettle Tea is quite good, very mildly flavored. And that salad looks amazing! Probiotics, and lots of them! Probiotics modulate immune response. I no longer need allergy medicine (and I used to be allergic to EVERYTHING). I’m looking at their website… is its the leaf or the root? ah, looks like leaf, from the description? Yes, I should have specified! The leaf is the part to use for infusions. The leaf, roots, and seed are all used medicinally for different purposes. Thanks so much for getting specific, Laura! Since becoming a vegetarian/vegan nearly seven years ago I seldom get any allergies despite living in the Pacific Northwest & when I do get them they are generally mild. However, prior to being a vegan I would get them more frequently & the remedy that seemed to work for me were foot baths using essential oils. If you can’t open it let me know & I’ll send you the ingredients. Good luck & feel better soon. This looks lovely, allergies or not! I can totally sympathize with you too! While I do not suffer from allergies myself, My Love is really feeling it right now, and it is no fun at all! Love this food as medicine concept. I’m glad you’re considering nettle tea–it’s so delicious. I use nettles from right outside here! Funny how different locations can be more allergy-causing. When I lived in Oxford for school, I knew many people who developed allergies there who had never had them before. Similarly in Hawaii. Guessing DC is humid and low-lying. Hope these things work for you! I’ve never really understood the reasoning behind classifying honey and bee pollen as “animal products” or nonvegan — especially for those who keep a vegan diet primarily for health reasons, but also for those concerned with ethics. It seems like such a fine line considering that so many plants rely upon bee pollination to grow. Can I respectfully inquire? Regarding allergies, minimizing your pollen exposure in little ways can help a lot — try taking a quick shower at night before bed, which makes sure you don’t take what you picked up on your body and hair during the day and spread it to your pillow, and wash your sheets pretty frequently during pollen season, change your clothes as soon as you can once you get home and leave your shoes, jacket, hat, etc. near the door so they don’t get pollen in your bedroom. I’m not sure about the health vegan standpoint, but I do believe many ethical vegans avoid honey because it’s production is still involved with the exploitation of another life- animal or insect. Also, I think “collecting” bees might have a negative effect on the pollenation of plants? Just a thought. As both an ethical and health vegan, I don’t eat honey. (Always hated the taste.) I also live in a semi-rural community where there are “free-range” bees, so to speak, and I don’t take issue with eating the honey produced from these local, small time farmers. Unfortunately, there is such a thing as mass produced honey. The beehives are kept on the back of large trucks and transported around to maximize pollen exposure. This is really hard on bees on a number of levels, especially since they use their sense of space and hive location for orientation and communication. Bees store their honey to eat for the winter; without it they would starve. On a personal level, though, I am all for small, private beekeepers keeping beehives (Michelle’s free range bees!) to keep up the bee populations in the face of the massive depletion in bee populations around the world. A friend of mine does this as a hobby and he tries very hard to make sure that the honey he harvests does not stress the bees too much and that they have enough for the winter. I am sure this is quite controversial for many vegans, but without people like him campaigning for the bees, I think the issue would largely be ignored and they might end up dying off before the problem can be solved. Ah, the great honey question! Molly, thanks for kindly inquiring! I should begin by saying that there’s definitely a spectrum of opinion in the vegan community on this one. I know vegans who don’t care at all (though those are primarily those who only identify as health oriented vegans, or plant-strong eaters). I know vegans who are adamant, and I know vegans who, like Ellani, above, will support certain kinds of beekeeping. I think all sides have made good arguments, so I’m just going to share my personal take-away. Cool? It’s definitely true that a certain amount of stress and death does result from all beekeeping. Smoke is used to pacify the bees, queen bees are often killed by the beekeepers, bees are fed artificial diets (more on that in a moment), and some bees are invariably crushed in the hives or when honey is collected. This is true both in small operations and in the huge ones (and yes, there is certainly some mass scale beekeeping). So if you’re avoiding any food that causes distress to animals, or necessitates their captivity, there’s at least some good reason not to consume honey. As a matter of moral consistency, if you’ve vowed not to eat any other sentient beings, or take anything that comes from them, honey falls consistently into this category, too. For many vegans, philosophical consistency alone is a good reason to simply avoid honey, and find other ways of sweetening our food. Do I think it’s possible that there are certain well intentioned beekeepers who are trying to valiantly fight CCD, and treat bees humanely? Sure. But I feel inherent discomfort with all forms of “humane” animal farming, small scale or not, because it continues to share the message that it’s acceptable to breed animals and take their products, so long as we do so in a particular way. And that “particular way” can quickly proceed down a slippery slope, and start to include all kinds of abuse (evidenced in the fact that many “humane” dairy and egg farms still perpetuate and participate in all kinds of injury/stress to animals). Then there’s the issue of the public example we set with our food choices: part of why I wouldn’t keep a pet chicken and only take/eat eggs that were laid over the natural course of time (if you’re wondering why I bring this example up, it’s a very commonplace scenario that vegans are asked to respond to–what if you had a pet chicken, and you could offer it a good life: would you eat the eggs?) is that my eating the eggs would share the message that it’s acceptable or desirable or necessary to do so. And as long as people think animal foods are necessary, desirable, or acceptable, they will find cheaper, quicker, more efficient ways to produce them than these tiny, ultra-animal-friendly operations. My personal feeling–and naturally, it is only one opinion–is that I can do more for animals by simply living a life in which I don’t eat them or their products at all. That’s the message I try to present to the world. A word I mentioned in the last graf–necessary–is also really important to me. Honey is not necessary or essential to my diet; I have agave, maple syrup, yacon syrup, dates, coconut crystals, and stevia–so many other options to choose from! So to me, eating honey would feel not only like murky ethical water (though I do very respectfully recognize the value of both pro and con arguments) but also feel totally pointless. 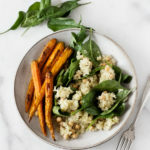 There are so many good ways to replace honey in one’s diet, and while I understand why and how people can go years lusting after cheese, I think it’s pretty easy to stop craving honey with a few small replacements. Last point: what about the fact that some bees are used in the production of a huge number of vegetable crops? Here, please allow me to admit a lot of ignorance. I’m not quite sure which farming operations do this–whether it’s all farms, some farms, etc. Of course if only some farms do, I’d gravitate toward avoiding them. Having grown vegetables in New Hampshire as a kid, and having and seen them grown on small farms in the region myself, I never saw bees being used as a part of the process, so I don’t imagine they’re a vital part of all farming. In the future, I’ll do what I can to research this assiduously. But I’ll also need to return to Donald Watson’s definition of veganism–doing all that is possible and practical to avoid injuring animals. I’ve heard said that some insects get killed and squashed in vegetable farming, too–what do you have to say about that, eh vegan?? Well, I say that I do my very best–everything possible and practical. Whereas it’s 100% possible and practical for me not to buy honey, my diet would surely be limited (nearly nonexistent) if I were to stop eating vegetables, too. And it would not be a diet I could realistically promote to other people, which means I couldn’t help anyone else to go vegan, either. And that would leave me with no means of encouraging the end of animal agriculture, which would defeat my intentions altogether. So I just do everything I can to live and share a life that is compassionate, all the while humbly acknowledging that, yes, there are almost certainly inconsistencies inherent to my actions and outlook. I make the best choices I can. Massive response. I should just put it into a post, no? Thanks for asking!! I’d rather eat local honey from a farmer than eat zyrtec. Zyrtec has been tested on animals and that to me is much worse than eating honey. To each their own! Well, that is an excellent point. The issue of nearly all OCD drugs (and prescription drugs) being tested on animals is of course an enormous one. As someone who aspires to a career in medicine of some kind, I’ve already tried to make peace with the fact that I will be working with, and sometimes prescribing, drugs that have been tested on animals. I also hope that, no matter what direction my career in health care takes me on, I can be one of the growing number of voices that is encouraging for changes in the way drugs are tested from within the health care community. You can count on it. This post certainly gives me options that are Zyrtec free, so we’ll see how things progress. Lovely response! Honey is an animal by-product, simple as that (to me). As an ethical vegan, I admit it’s hard for me to open up the definition of veganism for different interpretations. I am glad when vegans do address this issue of “humane” animal farming, and what that means within veganism, and you did so eloquently – thank you! Wool is another one that comes to mind (“what would sheep do with all their wool then, if we didn’t shear them?”). Hey Gena- thanks for the tips! You’re right, seasonal allergies are all the worse in Maryland. I barely ever had symptoms of allergies when I lived in MA, but when I moved down here I suddenly had horrible symptoms. Have you tried Rooibos tea? If you don’t want to wait for a shipment from Mountain Rose Herbs, you can head down to Flower Power in the east village – 9th St between 1st and A. The ladies in there are pretty knowledgable and you can certainly find nettle for an infusion. Allergies are definitely distracting and sometimes I have to just take the damn Claritin as well. Hope you find a solution! Thanks for the tips! I don’t suffer from allergies but my boyfriend complains incessantly all spring long so I’ll send this along to him. The salad looks so springy and colorful, a beautiful way to stick it to those seasonal allergies. Also, your article from yesterday is wonderful, I read and referenced it in my post today! I just love your approach to raw foods and to eating in general. I use to have terrible seasonal allergies, but I rarely have flare ups now (and I live in the sinus valley of Ohio) since I’ve been using Bio Allers Outdoor Allergy Tablets- they are homeopathic (sorry that sounds like an infomercial). This looks so good! Love the colors. I am embarrassed to say, I have never tried tempeh. This salad makes me want to! Also, one reader, Ellen, mentioned she found allergy relief through large doses of probiotics. I’ve been curious re. these in general for a long time, but have yet to take the plunge. At some point, Gena, I’d love it if you would discuss probiotics, as you’ve mentioned that you do take them periodically. Great post and perfect timing ad allergies seem to be getting to me way worse this year for some reason and I typically avoid OTC drugs fearing side effects. The salad looks fabulous, I need to make it soon! 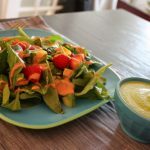 I love raspberry dressing but have never tried to make my own! I think raw honey and local bee pollen are the most amazing foods on the planet. They are pre-agricultural and can be procured without harm to the bees or to the environment. I eat both daily, or nearly daily; I think they are irreplaceable in terms of their nutrient denstiy, enzyme content, and other magical properties. If I were stranded on a dessert island with only two foods, I’d pick honey and pollen. Because I know I’d survive on them. I can’t even wrap my head around the arguments agains eating honey produced by local bee keepers. Who are exemplifying what it really means to live in harmony with nature. While Gena’s right of course that none of this is true of industrial honey, none of this is true of industrial production of vegan crops either, in which insects are killed deliberately, not incidentally. You can argue that you only eat “organic” and that no pesticides are used in the production of your fruits and vegetables and I’ll counter that I only purchase honey from righteous bee keepers. I’d certainly make the organic argument, but I also hear the argument for small scale, local beekeeping, too! First comment, ever; generally prefer to ‘lurk’:) I hail from Dreena Burton’s ‘hood, & am closer to your Mom’s demographic than yours. 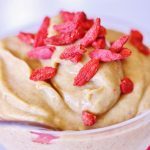 This year I’ve had quite a reprieve from seasonal allergies & have mostly attributed it to the improvements I’ve made in my diet/food choices(I don’t diet), with many thanks to you & other bloggers in the vegan community. However, two other constants over the last year have been MSM(taken for arthritis but apparently helpful for seasonal allergies as well) & green tea brewed with looseleaf tea & 1/4 to 1/2 a fresh org. lemon thrown in the pot. I love my morning java, but start with the green tea & sip on it throughout the day. I refill the pot after the first two cups so it never gets bitter. Belated congrats on your orgo pass. You are one very inspirational young woman & I always look forward to your updates. Enjoy your break from your studies. Two quick comments about the neti pot. I don’t think it really has value in lessening the allergy symptoms, but I do think it has value in keeping the allergy gunk from turning into a sinus infection. However, I have read a few alarming stories re: bacteria getting in through a neti pot…so I use distilled water now woth mine. I live in FL and also suffer terribly:( I am planning to try local honey next year….getting married and moving to my fiances house…oak trees in the yard, beautiful but they just kill me:( I will be looking back at these tips…we have an earlier season here! I found yoga inversions, especially headstand and dolphin pose, to be helpful for sinus issues. I hope you are able to manage your allergies in such delicious ways all of the time! Have you ever tried putting your chopped raw onion in ice water? If you chop it first and put in ice water, just for five or ten minutes it takes the “edge” off of the raw oniony taste and makes it a bit more mild…..
Have you tried a nasal corticosterioid spray like Flonase instead of Claritin/Zyrtec? It’s way more effective and also local vs. systemic which I like. Acupuncture worked wonders for me — I started getting it as part of my treatment when I was dealing with the worst of my food issues and overall anxiety and it was crucial to my eventual obtainment of health. When it came to the brain stuff, I felt a difference, a calmness, immedietely following treatment. However, when it comes to the other stuff, the physical stuff, it doesn’t work like magic. It isn’t flipping a switch. After about six months, I started noticing that annoying symptoms that I’d always had were suddenly disappearing. My hands and feet weren’t always ice cubes anymore. My digestion was much improved. My migraines stopped. My allergies were gone. I know acupuncture isn’t always affordable — I was lucky, here in Austin there’s a community clinic where you can pay what you can (maybe D.C. has something similar? Poke around!!) — but I can’t recommend it highly enough. ALSO, before I started getting acupuncture, I was kind of weirded out by the idea of it — it seems SO very alternative, after all — until I read Between Heaven and Earth by Harriet Beinfield and The Web That Has Now Weaver by Ted Kaptchuk. I generally like to have a basic understanding of something before I jump into it and these books were very enlightening. Best of luck with everything, Gena! Have you tried using fresh nettle in green smoothies? Stinging nettle is my all-time favorite green to use in green drinks. (Once blended or juiced they don’t sting.) I even eat them right off the plant sometimes–once you’re familiar with them, you barely get stung. The texture of the fresh leaf is about the same as peppermint leaves, and the flavor is like cucumber mixed with spinach. If they grow wild in your area, or you can find them at a farmer’s market, I highly suggest getting them fresh–even if it’s only to make tea. I keep fresh leaves in the freezer and steep them when I want nettle tea. The flavor is far superior (in my opinion) than nettle tea f rom dried leaves. Sorry to hear that you are suffering. I would recommend MSM, though you have to take this on an ongoing basis. An added benefit is that it is supposed to be great for the skin. I would second the recommendation for Quercetin. Above and beyond that I have recently discovered cranial osteopathy, which is an extremely gentle form of therapy that allows your body to heal at its own pace – I have found acupuncture to be far too strong and to precipitate very intense healing crises – by removing energy blocks in the body. I have been having CO for ME treatments and have found it to be very effective in tackling allergies – I can walk the hound past fields of rapeseed without a single sneeze or puffy eye. You could also try an entirely natural spray called Sinusoothe, which uses essential oils to blast away sinus headaches/ allergies. They are UK based but I know they have US distribution. I have used this in the height of allergy crises and found it to be effective,. Thanks for the advice, Kate! Great to know. your excellent info you’ve got here on this post. I am returning to your web site for more soon. I am glad to know that these food can help with allergies. One thing that has helped me during allergy season is nasal screens. They are so easy to use and you barely know they are there. They help block airborne allergens and I can go on with my day. Thanks for the post. Great post! Been reading a lot about different ways to deal with my allergies. Thanks for the info here!